You may not realize that property owners in Key West and throughout Florida often have a legal duty to maintain their premises in a safe condition. Homeowners, businesses, and other property owners and managers must act with reasonable care in order to protect you and other individuals who are on their property with permission. In other words, property owners, managers, and operators are legally required to take reasonable steps to protect customers, clients, and guests from dangerous conditions on their premises. When owners and property managers fail to uphold this responsibility, you may be involved in an accident and suffer serious injuries. One of the most common ways you may be hurt on another party’s property is through a slip and fall. Most property owners blame the victim for a slip and falls. However, the truth is that slip and fall accidents are usually due to negligent business operators. Spilled liquids, negligent maintenance, and failing to conduct routine inspections for dangerous conditions are all common reasons why slip and fall accidents happen. If you were injured in a slip and fall in the Florida Keys, call a Key West slip and fall lawyer at Gerson & Schwartz P.A. at (877) 475-2905. We offer free consultations so there is no risk or barriers for you to learn about your legal rights and options after an accident. Injured in a Slip and Fall in Key West or the Lower Florida Keys? South of the coast of Florida is an archipelago known as the Florida Keys. These islands are located in the Straights of Florida, which separates the Gulf of Mexico from the Atlantic Ocean. The Florida Keys are divided into sections known as the Upper Keys, which are closest to the mainland, the Middle Keys, and the Lower Keys, which are furthest from the coast. Among the Lower Keys is Key West, which is the southernmost city of the U.S. It is about 130 miles from Miami, and to get there, you must take the Overseas Highway and Seven Mile Bridge, which connects the Middle Keys to the Lower Keys. Key West is about 5.6 square miles of land and has a population of more than 26,000. 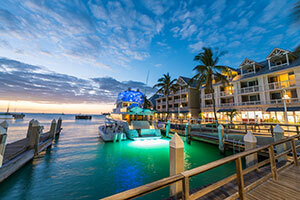 It is the most populace city in the Keys. It is also a very popular vacation spot due to its climate, rich history and culture, and nightlife. Many tourists come in on cruise ships, but others fly into Miami and drive to Key West or fly directly into Key West International Airport. Because Key West can be a busy and entertaining place, it is essential for business owners and homeowners to ensure their properties are safe for visitors. If someone who lives in Key West or is visiting the island slips on someone else’s property, then the property owner may be liable for the injuries they suffered in a fall. If you are dealing with this situation right now, call our slip and fall lawyers for Key West as soon as possible. If you believe one of these types of hazards was responsible for your fall on another person or business’s property, then contact one of our slip and fall attorneys for Key West. Property owners in Key West are not responsible for all injuries sustained on their property. They are responsible for knowing about dangerous conditions are on their property and either repairing the danger or warning guests. If they fail to maintain or inspect their properties regularly, repair hazards, or put up warnings about possible risks, then they may be responsible for injuries. In order for a property owner to be liable, you have to be a certain status on the property either an invitee or licensee. In either of these cases, you have permission to be on the other person or business’s property. However, even if you have consent to be on a person or business’s property, not all accidents and injuries are the property owner’s responsibility. You have to have been hurt due to a hidden hazard. You have to have encountered a danger that you could not see or perceive and then avoid. For example, if you slipped and fell, it may have been because a rug slid out from under your feet. That is not something you could have predicted. To learn more about when a property owner may be liable for your injuries, call our Key West slip and fall attorneys. Were you or a loved one injured in a slip and fall accident? If so, you should contact Gerson & Schwartz P.A. as soon as possible. We will listen to your story and analyze your rights under Florida premises liability law. If we find that you have a valid legal claim, we will guide you through pursuing compensation through an insurance claim and lawsuit. To schedule your free case consultation, you can contact us online or call (305) 371-6000.